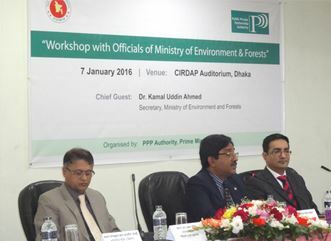 The Public Private Partnership Authority organized a workshop with officials from Ministry of Environment & Forest on 7th January 2016 at the CIRDAP Auditorium. 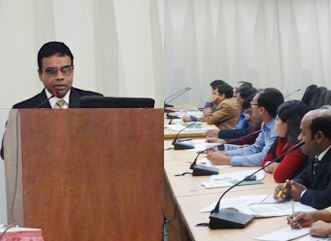 The objective of the workshop was to share the experience of implementing the PPP Program in Bangladesh. 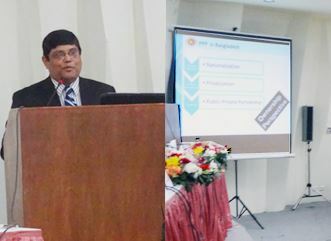 The Chief Guest at the workshop was Dr. Kamal Uddin Ahmed, Secretary, Ministry of Environment & Forest. Mr. Nurul Karim, Additional Secretary, Ministry of Environment & Forest was also present in the event as the session chair. The 1st session of the workshop, on the orientation of PPP Program in Bangladesh, was delivered by Mr. Faruque Hossain, Director General of CPTU. He particularly highlighted the history of partnership with the private sector in Bangladesh and briefly covered various institutional and regulatory structures associated with PPP in the country. In the 2nd session, Mr. Syed Afsor H. Uddin, CEO of PPP Authority provided an update on the recent PPP activities and achievements in Bangladesh. He accentuated how PPP had been established as one of the key components in supporting the infrastructure of Bangladesh into a middle income country. He highlighted the success in quality building a large PPP pipeline of over 40 projects in different sectors. He particularly highlighted the role of the PPP Authority and PPP progress so far in the country and also emphasized on aligning linked projects to PPPs especially in connection with the environmental considerations. Md. Abul Bashar, Deputy Manager of the PPP Authority highlighted various PPP processes in Bangladesh with particular focus on PPP Project Proposal form and PPP Technical Assistance form as part of PPP project development. He also informed that the event formed a part of PPP Authority’s regular communication updates to all of its stakeholders. The event was concluded after a thoughtful and participative Q&A session discussion on PPP capacity building requirement issues. It was highlighted that need for capacity building and appropriate identification and clustering of relevant government officials would promote overall PPP development effort in Bangladesh.